We did the math. Six substantial dishes plus a $2.50 putu piring and a round of sugarcane drinks split among four persons. Each had to fork out a meagre $7, which, if you look at Orchard Road’s $6 mee pok noodles at a food court, is considered a steal when you dine at Haig Road Food Centre! 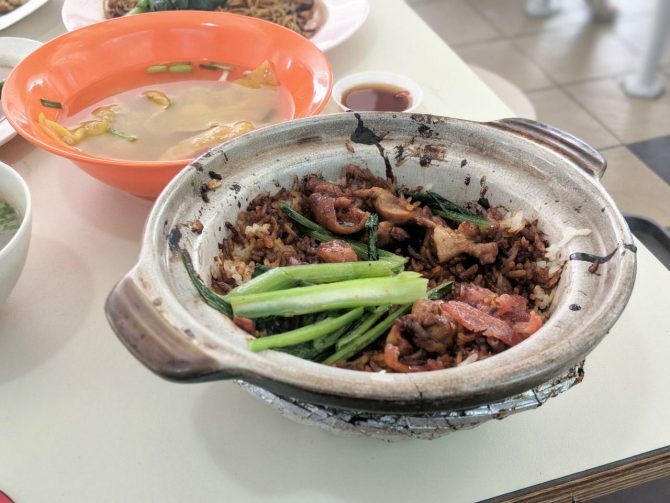 Located in the nook of Haig Road and Geylang, the food paradise is conveniently next to the wet market, so that fellow marketers, once done shopping, can adjourn next door for a breather of good food. Best part? The hawker fare is all at seriously competitive prices. We even chanced upon a store that sells economic rice (two veg + one meat) for less than $3. Since it’s in the Malay neighbourhood, the centre boasts an extensive line up of Malay and Indian Muslim stalls, so that you can get your fix of roti john, mee rebus and nasi lemak. What’s the makeup of a delicious claypot? Aside from having a noticeable wok hey aroma after properly cooked over hot coals, a clear indication of a good claypot is when you find a thin layer of charred, crispy bits of rick glued to the bottom of the pot. With a tender nudging, you should be able to free up the layer up to enjoy the burnt, crispy bits! At V2 Claypot Corner, the chicken claypot offering we had lived up to these expectations, including oh-so-tender chicken meat and crunchy leafy greens.